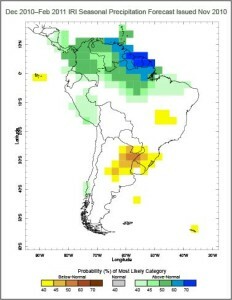 The government of Uruguay used this map and others like it as inputs for policy decisions, including the declaration of a State of Emergency, based on forecast of continuing drought conditions in winter of 2010. Our friends at the Center for International Earth Science Information Network have written a nice post that explains how IRI’s seasonal climate forecasts have been for decision making, focusing on a particular case in Uruguay. In December 2010, reports showed that many areas of Uruguay were headed for drought. IRI’s seasonal precipitation forecast map issued in November 2010 showed that these at-risk areas of the country were likely to experience less rainfall than normal in the months to follow, further contributing to drought conditions. In response to the combined data and forecasts, the Uruguayan government declared a state of emergency and quickly directed interventions to address the crisis and mitigate the potential consequences. Read the whole story on the Earth Institute’s State of the Planet blog.